Clothing/Jewelry Description A blue dress, a navy blue mid-length coat with the collar edged in pink, a red Shirley Temple type hat and patent leather shoes. Distinguishing Characteristics Caucasian female. Red hair, blue eyes. Many accounts spell Marjorie's name "Marjory." She has freckles on her face and she spoke with a southern accent in 1938. 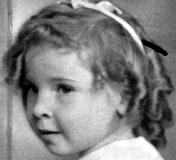 Marjorie attended a church service with her family members in their hometown of Bradford, Pennsylvania during the morning hours of May 8, 1938. Her parents decided to have a Mother's Day picnic afterwards in the White Gravel area, which was a 40-minute drive from Bradford. They drove south along U. S. Route 219, following an old railroad grade from Custer City to Marshburg, Pennsylvania. The Wests entered the White Gravel area from Chapel Fork Road in McKean County. Witnesses reported that two vehicles drove past the Wests' picnic site prior to Marjorie's disappearance. Authorities identified the cars and neither was involved in her case. At first it was believed that Marjorie had merely wandered into the woods and became lost. Hundreds of people searched for her in the countryside and her disappearance received a great deal of publicity. If she had been out in the open for more than a few days, she would have succumbed to exposure. The driver said that the individual said the girl was his daughter and asked the taxi driver where the nearest motel was located. The driver directed him to an establishment across the street. The man left the child in the car and went inside the hotel, but there were no vacancies. The man returned and inquired about a local liquor store. The driver instructed him to stop at a bar down the road. The taxi driver identified Marjorie as the man's passenger several days later. A man matching the description of the unidentified individual refueled at a gas station outside of Thomas and an attendant reported seeing a bundle wrapped in a gray blanket in the backseat of the car. The man's identity remains a mystery. Additional speculation pointed towards the Tennessee Children's Home Society near Memphis, Tennessee. 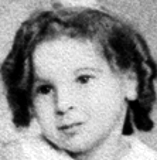 The facility was operated by Georgia Tann, who was initially lauded for placing at-risk children in adoptive homes. 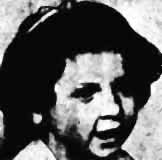 Authorities eventually learned that Tann had kidnapped over 1,200 young children during the years 1932 through 1951. The majority of victims were abducted from states bordering Tennessee, although some children resided in Connecticut. Judge Camille Kelly approved Tann's custody bids for the majority of the victims. Tann placed most of the children with childless couples in New York City, New York or Los Angeles, California. None of the theories have been proven and no one has been implicated in Marjorie's disappearance. Dorothea strongly resembles Marjorie and her photos are posted with this case summary. 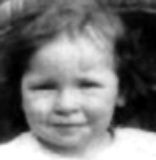 Marjorie's case remains unsolved. Updated 4 times since October 12, 2004. Last updated October 10, 2015; picture added.